I’m always thrilled when we get a baby girl “cake pop” design request. As the mother of boys, my crib bedding consisted of blue, brown, puppies, boats, plaid…you get the idea. 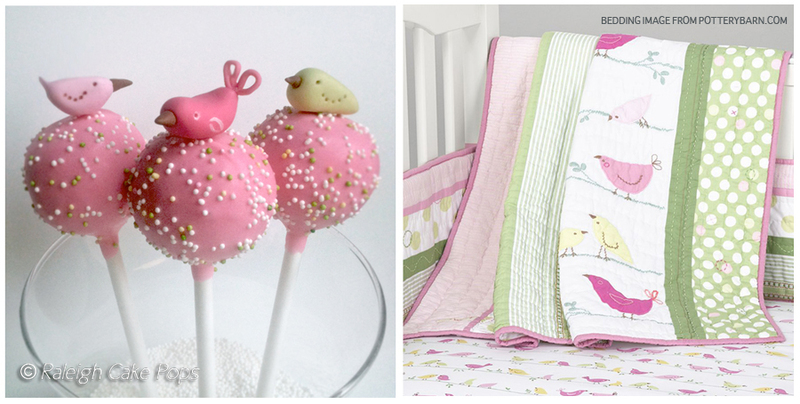 Our latest request…little birdies to match a darling baby girl bedding set from Pottery Barn called Penelope. Awww! If you want to see the bedding head on over to Pottery Barn! 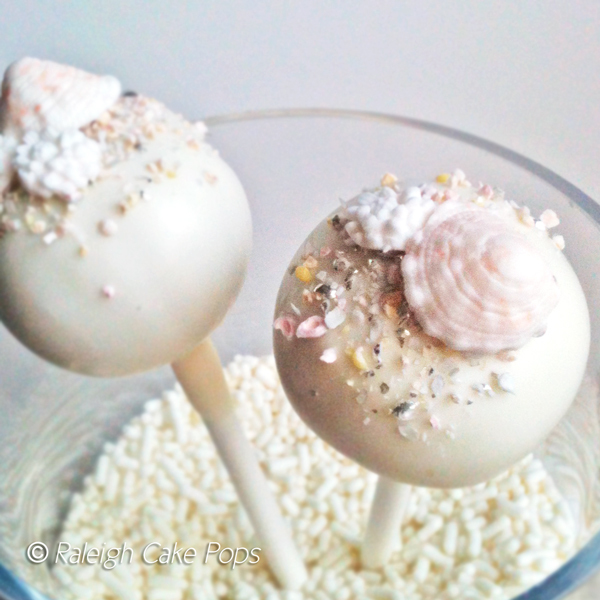 Beach Cake Pops …something new! In June of 2012, we traveled to the beach to meet with a bride who was planning a wedding on the Carolina coast. 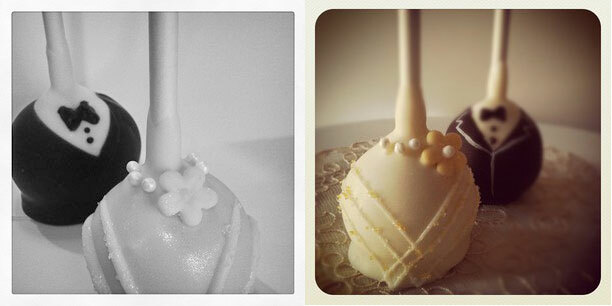 It took no time at all to decide how her cake pop “wedding cake” should be designed! …and voila!, our “beach” cake pops were born. I recently tested a mall “cake pop” kiosk at Triangle Town Center in Raleigh, NC. If you’re a cake popper you may have thought about trying this concept as well, so this post is for you. Keep in mind, I don’t usually post how-to’s so please give me a shout with any questions–I’m always happy to help. A rep of ours (sweet Connie) thought a mall kiosk would be a huge success! Long story short, we signed a one month lease/test to see if she was right. We were all excited to test a concept that, as far as we know, had never been done before! We worked fast and kept a tight budget. We purchased a minimal amount of signage (from our friends at T3 Sign Design), hired a few (awesome) part-time employees, and started poppin’! EXPOSURE! Customers being able to “find” you is a HUGE factor in any business. If you’re a “dot com” you know what I mean. SALES! You’re in a location with constant foot traffic so sales are inevitable (what a great perk!). Want to know a secret: I’ve worked in food service marketing for the last 10+ years. When working in a location such as this (or as a guest in a big box retailer) THE EMPLOYEES ARE YOUR #1 CUSTOMER and your referral network…keep them happy–or else! We offered an employee discount from day 1. HOURS! Malls and big box locations have very loooong hours. If you’re a popper you will have to hire staff (or have a great family that will work for free) because who will make the pops? STAFF! Our employees were awesome but we still ran into the norm…call-outs, no shows, walk-offs, etc. You must have a back-up plan. PRODUCT! Like I mentioned earlier, pops don’t last. We don’t let our pops go for more than a few days…the sticks yellow, the chocolate gets brittle, etc. You’ve got to have fresh product and account for waste (yes, you will throw out pops). ADVERTISING! It was tough having a temporary location because it was difficult to advertise. So if you do sign a long-term lease try loyalty cards, Facebook promotions/discounts, Tweet to locals…and blog of course! 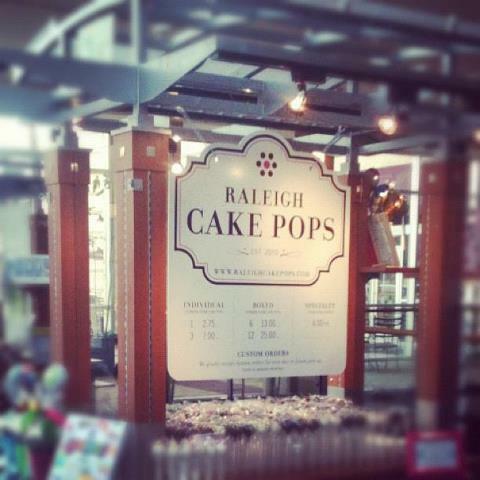 While every cake pop company is different, for us, Raleigh Cake Pops, a kiosk didn’t make sense. We have a busy dot com, large wholesale client list, corporate commitments, weddings, etc. We didn’t want to spread ourselves too thin. Can it be a success? YES! Although in our opinion, it should be your only means of selling–like a shop–that’s how much attention it requires. There are other options too; if you’d like to test a mall location check with management to see if you can “pop in” for special events. Most malls will let you set up shop for a week or so during special events like Mother’s Day and July 4th. “Where to buy cake pops in Raleigh” is a popular search term that directs visitors to our blog…daily. We’re RALEIGH CAKE POPS and we’ve been making delicious cake pops since 2010. We’ve created tens of thousands of cake pops in the last year alone–can you believe it? Amazing. Call us (or email) at 919-438-1327 or 877-546-6405 to place your custom order. TONS of Local/Triangle/RTP Corporate Events. Hundreds of Parties, Birthdays, Showers, and more! 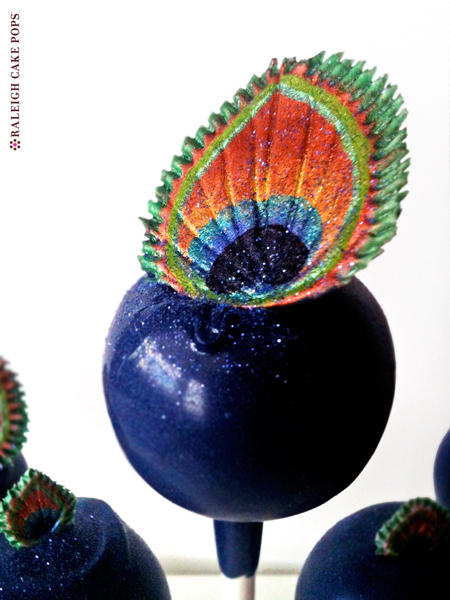 We’ve had several requests for peacock wedding and shower cake pops. And since we believe that less in more, a simple feather seems to work fabulously.